5.0 out of 5 starsWhat an eye opener, a good read about raw courage and nerve. Am so pleased to have read this book, about a part of WWll Of which I had no knowledge. It is pacey and at times heart stopping. It was an incredibly bad time for Jews, and heartwarming to read of the Jews who successfully fought back. The hardships and privations born these brave Jewish partisans are incredible, yet they did it and many survived. A truly great read. It is hard to imagine a life lived surrounded by enemies and betrayers. Not like our soldiers who faced the enemy and had safety behind them. 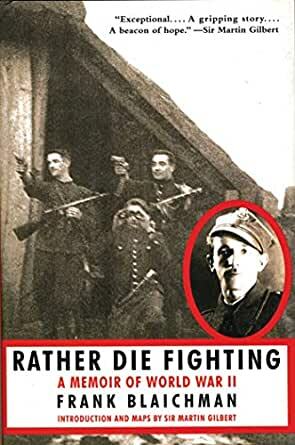 This is a fascinating book written by a Jewish man who served in the partisan movement and Polish underground during World War Two. Frankly, we are lucky to have this book given the dangers this man faced every day of his life during the war. It is not an easy book to read. The author loses most of his family in the first thirty pages of the war. He refuses to go quietly and literally would prefer to die fighting the Germans. His first rifle was a pitchfork modified to look like a rifle with a bayonet on the front end. The result was in the dark he and his men could be mistaken for Polish soldiers. Things progressed until they eventually found serious weaponry or captured it from the Germans and turned the weapons on the invaders. It is no minor miracle the man survived the war. As a Jew, he had plenty of people trying to kill him. Eventually, after the war he moves to the United States. This had me wondering how many of these brave men did the very same thing and started their lives over. One of the things that became clear to me was how the war shaped post-war Poland. Large populations of people, their culture, and private property were displaced or destroyed during the war. It was hell, for sure. However, today the nation simply cannot be what it was before the war. Too many people have died. One of the best things about the book is a very personal story. The author, despite living in swamps and forests, from minute-to-minute, manages to find the love of his life. I thought it was magnificent he succeeded despite all odds. Over all I enjoyed the book a good deal. I think it provides great insight into an area of history that should never be forgotten. There are many lessons to be learned from this man’s valor and perseverance. I am grateful to read it. If you are interested in learning more about the time period I would recommend Masters of Death by Richard Rhodes as it provides a great deal of information about the destruction of Poland and Russia as a result of the war. Frank Blaichman's narrative of the Jewish partisans fills a void that searchers for Jewish resistance have longed for since WWII. So many stories of the Holocaust depict Jews, rightfully so, as victims, it is refreshing to read about courageous Jewish partisans, who determined to fight and die with guns in their hands, rather than submit to Nazi exterminations. It is also a testament to the courage of the Polish gentiles who unselfishly risked their lives and that of their families to aid and protect these partisans. Not all Poles were anti-semites. A very good read. Blaichman's story is inspiring. To come of age in the midst of the Holocaust and to make the decision to leave his family and start down a path that led to survival and vindication for his family's murder is hard to imagine. His is a wonderful story of triumph in the face of unimaginable adversity. Did not expect the story to be so good and so heroic. I am grateful for this story because I had no idea so many Jews fought back. Truly inspiring. Writer and fighter. This is a great story about people who put their lives in danger. They suffered cold, hunger and constant fear of betrayal. They continued to fight with the end of the conflict undetermined. Read the story and be inspired.